Evolutionary Art and Computers is a book written by William Latham and Stephen Todd. 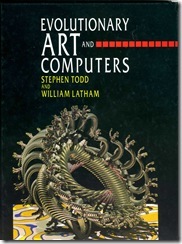 The book provides an insight into the processes behind Latham’s use of computers to create evolutionary art. It outlines in detail the programs developed by Todd and used by Latham such as ESME and Form Grow as well as the Mutator code they developed. In addition the book also details Latham’s creative process from initial concepts and hand-drawn sketches, through to their realisation as 3D virtual sculptures and animations.